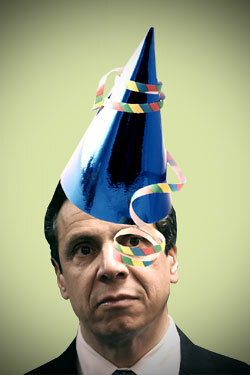 The New York Times ran an editorial today that trashes Governor Andrew Cuomo’s proposal for a 2% property tax cap. Personally, I think Mario needs to go to Albany and whack some sense into that kid of his. Seems the NY proponents of this insanity likes to cite Massachusetts as the exemplar, but the Times came back with a realistic look at our experience with Proposition 2 1/2. Not surprising, the Albany politicians and business leaders championing the tax cap don’t like to talk about California. Instead, they point to Massachusetts, which capped property taxes at 2.5 percent in 1980. It wasn’t a happy tale there, either. Communities starved of needed revenues were forced to lay off teachers, police officers and firefighters and to shut libraries and senior centers. Massachusetts schools suffered so badly that the Legislature had to pump in more and more state financing, especially to the poorer school districts. Mr. Cuomo calls the proposal “a game changer.” He’s right. In the same way that Proposition 13 has ravaged California, a New York property tax cap would do huge damage to already struggling schools and the state’s long-term economic competitiveness. California’s education system was once the envy of the nation. Education Week now ranks it 46th for achievement in grades K-12, below Alabama and South Carolina. New York schools currently rank 8th. For how much longer? Mr. Cuomo and other backers insist that communities will still have a choice. The cap could be overridden by a vote of 60 percent of residents in the tax district. (Whatever happened to a simple democratic majority?) Wealthier taxpayers may well vote that way, especially to maintain good schools. It is far less likely to happen in the poorer districts. And, what’s this? Tax breaks for the wealthy at the expense of public schools? Gov. Andrew Cuomo and the New York State Legislature have already adopted a state budget that drastically cuts funds to schools and local communities — cuts that were far deeper than needed to balance the budget because of Mr. Cuomo’s indefensible refusal to extend a tax surcharge on New York’s wealthiest residents. Now they want to adopt a cheap political tool — a 2 percent property tax cap — that would only further devastate communities around the state that can least afford it. And now, Pablo’s analogy test. Seems the lesson is simple. Even if you really like the parent, don’t vote for the kid. Property tax rate: $37.41 per $1,000 of full valuation; county rate is $4.59 per $1,000 of assessment” This means on a house valued at 200K you pay $8,400.00. You think that is fair ? Taxpayers have little or no control over property tax – just like Massachusetts before Prop 2-1/2. The middle class has been driven out of NY State. Only the very richest or poorest remain. …than they do over any other tax. Tax policy is decided by elected officials who are accountable to the voters for their decisions. It’s trojan horse. If the people pushing these things just wanted economic sanity, they’d be pushing measures that were much more reasonable, like making the ‘trigger’ for a vote be on anything above level funding programs. I think it’s perfectly fair game to force votes on major infrastructure projects, or creating additional programs, etc., but not for the cost of inflation. As decent as our schools are today on the whole, they’d be better if 2 1/2 were not in reality a Randist-style Trojan Horse, and Prop 2 1/2 still has us on the course for a fiscal nightmare in the future — in fact, we almost certainly would have weathered the Great Recession better had 2 1/2 not existed. $42/1000 is a high rate, but the rate doesn’t matter as much as the amount someone pays. How many $200,000 houses are there in Buffalo? Springfield gets knocked for having a high rate (close to $25), but our property is affordable, so the tax bills are reasonable. What do you suggest Buffalo should do? Cut services? Will that make people want to live there? If you look at this state, the towns with the highest property values are those with high tax bills. People seem to not t mind paying for services. A property tax cap bill just winds up screwing up the housing market, as people “sort themselves” (a Grover Nordquist quote) so that the rich wind up in certain communities (with high taxes and high services) and the poor wind up in other communities (with high taxes — to them — and no services). And then towns only allow high-end development, forcing out younger people for generations. in terms of fairness. If you live in a nice home, and expect nice services including roads, schools, police, fire, public health, and so forth, you’ve got to pay your share. If Buffalo suddenly became the in thing and the houses doubled in value tomorrow [with no other changes in population or buildings], would services double? Nope. The tax rate would be cut in half. The more reasonable question is: irrelevant of property values, is $8400 the right property tax for the owner of that kind of home? My hunch is that it’s not so far out of line. And I’ve got four cousins who grew up in Westchester County NY, went to college in Buffalo, and now live near Rochester. I know the area at least a little bit. While I do think those property taxes sound high, it is utterly ridiculous to suggest that the middle class has been driven out of NY state. You should not expect to be taken seriously if that is going to be your line of argument. Because a tax rate of $42.00 per $1,000.00 is low? 4.2%. Too low? Not really. … is that worth $8K per year? Does the Pope wear a funny hat? Does Ayn Rand wear a funny ideology? Right now I rent and the landlord has the direct responsibility of paying the tax, but he conveniently passes a good deal of if off to me. We’ve had several fire alarms recently and the FD has been here fairly quickly so I’m not complaining. My oldest son is touring high schools and our local one is pretty run-down… Was even considering the hassle and extra expense of sending him to a regional school, or even a private school, strictly on the dilapidated condition of the building, when it was announced that a $45 million dollars reconstruction was about to get underway, funded by the state… that is to say, from existing taxes. But the HS should never have been allowed to deteriorate to the level it did, and that’s as a result, a direct result, of too low property taxes. So, would I pay 8,400K each year to ensure that I get a nice house and what services I want to support that house,? Yes. I would. Over and above sales and income tax. Yes. I would. And yes, to answer your other question, I think that’s EMMINENTLY fair. Stuff like this prevents me from being a Democrat. That winds up being $800 a month, after you throw in water and sewer charges, for old, drafty, triple decker type housing, which is what $200K buys you, even in NY, and even after the bust. That is a pretty big monthly bite, even if the po-po are nice to you. Having grown up in NYC, I can say this was absolutely a factor in my not living there– and certainly was for the rest of my family. If you work in manhattan, and can afford it, you live in CT.
Years ago, in my redder days, my dad commented that nothing turns liberals into Republicans like kids and a mortgage; I suspect that this is one of the reasons why. Stuff like this prevents me from being a Democrat. Stuff like that merely re-inforces your own proclivity to be other than a Democrat. That’s your problem, not mine. That winds up being $800 a month, after you throw in water and sewer charges, for old, drafty, triple decker type housing, which is what $200K buys you, even in NY, and even after the bust. That is a pretty big monthly bite, even if the po-po are nice to you. Here’s an excercise: how much would you pay, do you think, on a monthly basis for these things if the government didn’t provide them…? No matter the draftiness or the level of deckers… how much do you think it would cost you to haul your own water, secure your own boundaries, keep the roads accessible, put out your own fires,pay your kids teachers and keep the lights on? Here’s two particular hints: A), it would be far far greater than 800 per month and 2) it wouldn’t necessarily be coupled to the value of the property. Honestly, if you really want to lower the property tax, give communities other ways to pay for local services. The real problem in New York is the plethora of local taxing authorities outside of cities. You have towns, but there are also incorporated villages that have the option of assuming some town services (police, highway, zoning). Villages and special districts often cross town and county lines. You have independent water districts, school districts, fire districts, library districts, garbage districts, street lighting districts, and other special taxing districts that have their own line on the property tax bill. The answer in New York is special district reform, consolidating special district functions on the town and county level, but that would be about as popular as merging municipalities in Massachusetts. the NY tax systems is really screwed up. I would add that $8400 in property taxes is significant only in the context of other taxes and revenue streams. If income taxes, for example, were significantly lower, high property taxes would make sense. Add in an income tax that can be up to 10% and a sales tax, there is not a lack of revenue, there is a lack of spending control. While you may complain about PROP 2-1/2 – a lot of cities have never come up against this limit – aka Boston and Cambridge. BTW what business in their right mind would locate in Buffalo ? While NY has some of the highest state taxes in the country, the overall difference between NY and a run-of-the-mill state is not all that huge. Given the fact that NY is not a “run-of-the-mill” state, it shouldn’t really be expected to have a run-of-the-mill tax — which is the context I was talking about. NY has unique circumstances, problems and challenges that perhaps only a few other states could relate to, and that’s just simply going to cost more to deal with. That isn’t to suggest there isn’t room for improvement, particularly along the lines of consolidation re: the thoughts on that subject up above on this thread, but a worse-than-prop 2 1/2 proposal would be no solution, and that particular variety would certainly send municipal governments in NY in a freefall, which would be far worse for NY than moderately high taxes.